Join us at NSLM as Carol C. Mattusch, Mathy Professor Emerita of Art History at George Mason University, compares modern riding, tack, and philosophy with that of the ancient Greeks. Professor Mattusch specializes in classical bronzes, in particular the connections among technology, artistic styles, and the market in the ancient Mediterranean world. Mattusch curated the exhibition Pompeii and the Roman Villa: Art and Culture around the Bay of Naples (2008-2009) at the National Gallery of Art in Washington, DC. She has published extensively on ancient Greek and Roman art and her books have won awards from the Archaeological Institute of America and the College Art Association. Mattusch is also an equestrian, with a special interest in ancient horsemanship. 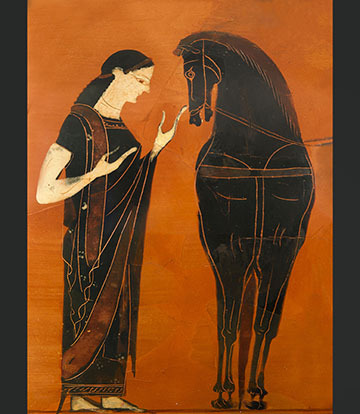 She recently contributed an essay titled “On Ancient Greek Horsemanship” to the NSLM exhibition catalog, The Horse in Ancient Greek Art.